dNeurosurgery (M.L. ), Johns Hopkins University, Baltimore, Maryland. SUMMARY: Central nervous system vasculitides are elusive diseases that are challenging to diagnose because brain biopsies have high false-negative rates. We sought to test the ability of contrast-enhanced, high-resolution 3D vessel wall MR imaging to identify vascular inflammation and direct open biopsies of intracranial target vessels and adjacent brain parenchyma. Eight of 9 specimens revealed vascular inflammation. We conclude that vessel wall MR imaging can identify inflamed intracranial vessels, enabling precise localization of biopsy targets. 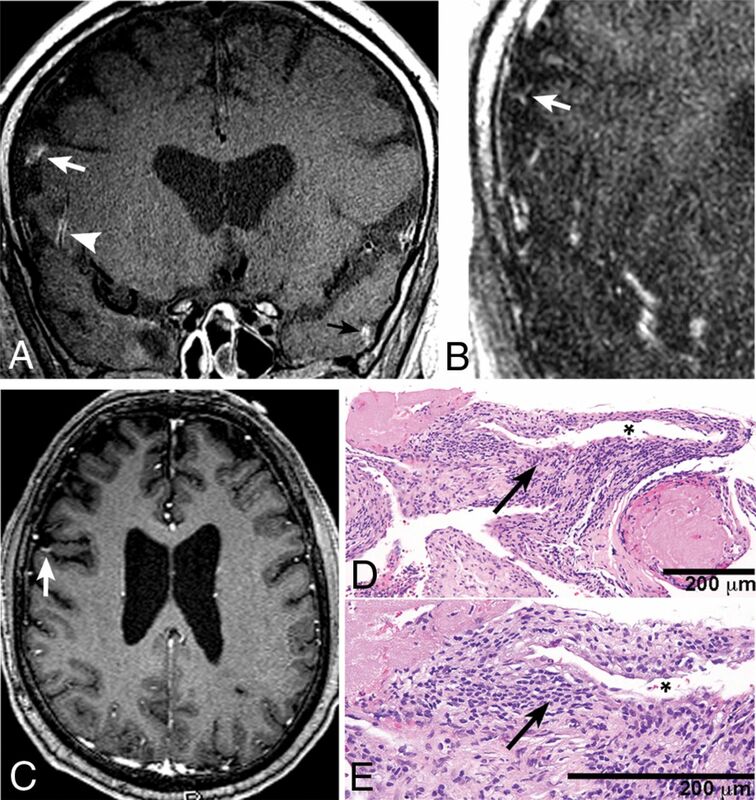 We hypothesized that vessel wall MR imaging (VWMRI)14 can identify inflamed intracranial vessels and precisely localize biopsy targets, thus aiding in the diagnosis of CNSV and its attendant pathology. We present 9 patients (On-line Tables 1 and 2) consecutively admitted to the Johns Hopkins stroke service between 2012 and 2016 for ischemic stroke with clinical concern for CNSV and no reasonable explanation for a noninflammatory cause.4 Work-up for hypercoagulable state, rheumatologic disease, malignancy, cardiac dysfunction, and infection was unremarkable for all patients except patient 6, which revealed Varicella zoster virus immunoglobulin G in the CSF. All 9 patients referred with intent to biopsy underwent VWMRI and subsequent biopsy and were therefore included in this prospective study and consecutively entered into our data base. The institutional review board approved this study and provided an exemption to allow the inclusion of de-identified data for patients from whom we did not receive written consent because the VWMRI was performed as part of clinical care. VWMRI examinations were performed up to 7 days before biopsy (mean, 2.2 days) on a 3T MR imaging scanner (Magnetom Skyra; Siemens, Erlangen, Germany) using a 32-channel head coil. Fiducial markers were placed, and a standardized MR imaging protocol was implemented for all patients that included a 3D time-of-flight MRA (acquired resolution, 0.5 × 0.5 × 0.55 mm3), pre- and postcontrast 3D VWMRI (acquired resolution, 0.5 × 0.5 × 0.5 mm3), and a 3D contrast-enhanced MRA (acquired resolution, 0.52 × 0.52 × 1.04 mm3) of the intracranial vessels (On-line Fig 1). Diffusion-weighted images of the brain were obtained for all patients, and susceptibility-weighted images (acquired resolution, 0.70 × 0.70 × 1.50 mm3) were obtained for 5 of the 9 examinations. Postcontrast T1 echo-spoiled gradient-echo images were obtained for surgical navigation. The 3D-VWMRI sequence design was previously described, and T1-weighting was implemented to highlight contrast enhancement (TR/TE, 800/25 ms; turbo factor, 30; echo spacing, 5.6 ms; generalized autocalibrating partially parallel acquisition acceleration, 2; FOV, 160 × 160 mm2; number of averages, 1.4).14,15 VWMRI was acquired in a coronal plane (112 slices [56 mm]; 9.5-minute acquisition time) and, after contrast administration, was oriented in multiple planes (axial [80 slices, 40 mm; 7.5-minute acquisition time], coronal, and in some cases, sagittal) to enable greater coverage of intracranial vessels, including distal branches. Contrast-enhanced MRA images were acquired during the intravenous administration of gadobutrol (Gadavist; Bayer Schering Pharma, Berlin, Germany; 0.1 mmol/kg) with arterial and venous phase acquisitions, and postcontrast VWMRI acquisitions began 5 minutes after contrast administration. All MR imaging examinations were analyzed by a neuroradiologist (B.A.W.) using a PACS. 3D-VWMRI was reconstructed in multiple obliquities and was used to visually identify vascular inflammation (present/absent) based on segmental, concentric enhancement of the vessel wall and/or circumferential, periadventitial enhancement following a vessel segment. Evidence of atherosclerotic features including calcification, a fibrous cap and lipid core, or focal, noncircumferential wall thickening excluded the diagnosis of vasculitis. The 3D-TOF MRA and contrast-enhanced MRA acquisitions were reconstructed and coregistered with the VWMRI sequence to isolate the vessel of interest in long and short axes. Because the lumen of very small vessels could not always be identified on VWMRI, small-vessel involvement was suspected on the basis of the linear configuration of inflammatory enhancement (Figure) and was corroborated by the identification of a lumen on the reconstructed contrast-enhanced MRA and TOF MRA source images or the susceptibility-weighted images when available. Diffusion-weighted imaging (on present and prior examinations) was used to exclude foci of enhancement due to subacute infarction. The inflamed vessel segments were then reviewed with the neurology and neurosurgical services to reach a consensus on a vessel target that avoided eloquent areas, was superficial, and was preferably venous. High-resolution vessel wall MR imaging protocol for identifying a surgical target in a 33-year-old man with suspected intracranial vasculitis. A coronal reconstruction of a 3D-VWMRI sequence (acquired resolution, 0.5 mm isotropic, A) shows evidence of vasculitis, including circumferential enhancement and thickening of the wall of a small branch of the right MCA (white arrowhead) and of small cortical veins (arrow). The right frontal cortical vein (white arrow), confirmed to be a vein on the venous phase of the contrast-enhanced MRA (B), was selected as the target. Note that the vessel is identified on the 3D echo-spoiled gradient-echo sequence (C, arrow) acquired for surgical navigation but does not appear abnormal (D and E). Hematoxylin-eosin-stained biopsy section shows significant transmural inflammation (arrows) of the blood vessel wall. The lumen is indicated by asterisks. Open biopsy was performed with the patient under general anesthesia using fiducial markers. The target vessel and adjacent brain parenchyma were biopsied with the aid of an image-guidance system (Brainlab Cranial Navigation Systems; Brainlab, Feldkirchen, Germany). M.L. was able to identify and biopsy a vessel at the identified coordinates. The targeted blood vessel and surrounding brain tissue were obtained from each patient (On-line Table 2). Blood vessel biopsy analysis from 8 of the 9 patients revealed vascular inflammation via direct tissue examination (Figure and On-line Fig 2). The etiology of CNSV for patients 1, 2, 3, and 9 was primary CNS angiitis; for patient 4, it was amyloid-β-related angiitis; and for patient 6, it was Varicella zoster virus vasculitis. Although we confirmed perivascular inflammation for patients 7 and 8, we were unable to find a cause. Brain biopsy specimens showed no evidence of parenchymal inflammation in all except patient 7. The vessel specimen from patient 5 did not reveal inflammation but instead a multitude of thickened blood vessels with amyloid deposition. There were no postoperative complications. We present the first reported study to use 3D-VWMRI at 3T for identifying CNSV. Notably, we show that VWMRI can be used to direct biopsies of inflamed intracranial vessels with high accuracy (89% in our series), which is a substantial improvement over the standard approach (sensitivities as low as 36% in prior studies).3,7,9,17 The success of our study was largely attributable to our ability to implement a 3D high-resolution VWMRI sequence that enables evaluation of a large volume of intracranial vessels, maximizing the number of potential targets that could then be reviewed for accessibility and safety. There are several limitations of this study: 1) Although the VWMRI sequence was acquired using a TR of 800 ms to produce T1-weighting, some inherent proton-density weighting could not be eliminated, and this issue accounted for areas of mild hyperintense signal from remote white matter ischemic injury. We acquired precontrast VWMRI to help distinguish this hyperintensity from true enhancement surrounding small parenchymal vessels. Consequently, we confirmed vascular enhancement only when postcontrast signal was unequivocally high, so vessels with milder postcontrast signal were excluded from consideration. 2) The 3D-VWMRI sequence can result in inadequate flow suppression, depending on the size and orientation of the vessel.18 We acquired the 3D-VWMRI sequence in multiple planes, so most vessels were captured in the long axis relative to the scan orientation. Furthermore, we used contrast-enhanced MRA images to confirm patency of the lumen. 3) Shifting of vascular structures from the craniotomy and opening of the dura could lead to false-negative specimen analyses. Nevertheless, in our cohort, every patient except patient 5 was confirmed to have CNSV on biopsy. VWMRI was unable to distinguish inflammation located in the transmural or perivascular space. Our data indicate that VWMRI can be used to target and improve the yield of biopsy in patients with CNSV. We suggest that biopsy remains instrumental in tailoring therapy because VWMRI was unable to distinguish among primary, infectious, and/or any etiology leading to perivascular inflammation. Disclosures: Ye Qiao—UNRELATED: Patents (Planned, Pending or Issued): 3D high-resolution intracranial vessel wall imaging technique, US Patent Application 13/922,111. Michael Lim—UNRELATED: Consultancy: Bristol-Myers Squibb, Merck, Tocagen, Stryker; Grants/Grants Pending: Bristol-Myers Squibb, Accuray, Agenus*; Patents (Planned, Pending or Issued): for radiation and immunotherapy. Bruce A. Wasserman—OTHER RELATIONSHIPS: Patent No. 13/922,111 for the 3D high-resolution vessel wall MRI technique used in this study. No financial gain (ie, no royalties or licenses). *Money paid to the institution. Accepted after revision June 17, 2018.